For most of this past year I have been working on the critical element of my creative/critical PhD on how the lyric might offer a co-worlding of human and ocean, moving between texts on phenomenology and posthumanism to write chapters and deliver conference papers. For two and a half weeks this June I left the books behind to experience a place that was not so simply read. The idea had been to use this fieldtrip to explore new-to-me research methodologies, to extend my understanding of durational timescales and create new work from a position of “not-knowing”, just as we don’t really know what is in store for us when the earth’s temperatures rise by 2˚. The expedition leader was Sarah Gerats, an astonishing performance artist in her own right, with years of experience in Polar exploration. She, along with three other guides (two local Norwegians and a Chilean marine biologist), arranged our landings: that were either stationary, short or long hikes, zodiac explorations in front of or alongside glaciers or through sea ice, or walks across moraines and along beaches strewn with driftwood and plastics. Her own artistic practice, alongside weather and sea conditions, informed the team’s decision-making as to where and for how long we were anywhere. We, the artists selected for the residency, were beholden to these decisions and to the territorial remit of her and the other (armed) guides: sometimes we had larger areas where we could roam out of sound (if never sight) of others; sometimes smaller spits of land where the scale of the environment around us diminished the landing party to fleeting insignificance. Distances were impossible to calculate. What looked a few hundred metres away was actually a couple of kilometres. It was June: the sun did not set. Trees grew laterally, close to ground. What appeared as solid rock, a sandy or snowy beach was knee deep claggy mud. Any piece of land could hold evidence of the ice cliff front of a glacier formed 4000 years ago; a calving from five minutes ago; lines of a 100 year old glacial retreat; fossilised coral from up to 300 million years ago when Svalbard was 50˚ further south. Add to that the hiss and pop of billion year old oxygen from the bitty bergs that streamed past us; a rumpled iced smear of blood from a recent feeding encounter; tantalising glimpses of cetaceans that barely sliced the sea surface; bucketfuls of innumerable dinoflagellates; tumbled forests of driftwood from Siberia; barnacles the size of my thumb; a snarl of fifty odd walruses not giving a toss about thirty or so of us being ten metres away; desiccated jaws of fox, bear beaks of puffin and kittiwake; countless fishing nets and thick rope embedded in beaches; algae thick enough to prevent landings and reading the environment became a fulltime occupation. We made no decisions on where we went, how we went or how long we stayed wherever we got to. My brain, at least, was on full receptor mode, scrambling to keep up, to make sense and ultimately wondering how to make meaning from it all. Throughout I wrote, wherever we were: on land or on the ship: documenting where we went; what I and other artists saw and felt; making notes on the flora and fauna, the glacial movement, the driftwood, the isolated trappers’ huts, sounds and textures around us as well as evidence of what had been before us – through skeletons, fossils, eggshells. 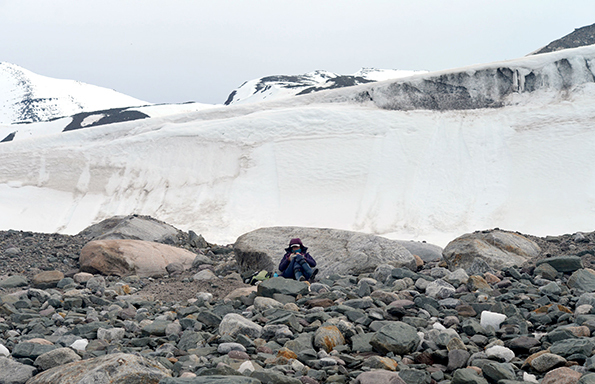 I took photographs, videos, made audio recordings of sea ice and glacial calvings, constructed a book that attempts a map of a glacier, and wrote a postcard a day to a Liverpool University colleague. I also witnessed what other artists were making or doing there, talked to them about their intentions or confusions, or attempted to siphon through them what I felt or thought. We left with materials I doubt any of us would have presupposed gathering: multiple forms of documentation including the more subtle materials of enlarged imaginations, disrupted emotions and synthesized experiences. I spent the first few weeks on my return avoiding telling friends about it: not wanting to reduce the experience into anecdotes that became fixed in their vocabulary. I was wary of my photos: they showed fragmented moments that for a particular instant were privileged above another, a superficial gloss of some deeper indeterminate response. I was agitated, wanting to express something not knowing where to begin. I have been communicating with some of the artists, sharing thoughts that have risen from this perspective, ideas for work, reading suggestions, confusions about what to make from it, how necessary is putting ‘meaning’ to the trip. Whatever tangible outcomes arise from the trip, I am certain that it will deepen my practical engagement with my theoretic reading around the posthuman and phenomenology while continue to provoke questions that will resonate through both my critical and creative writing. Exactly how, will become evident in time.